If Myanmar is going to eventually become a thriving economy equal to it’s Asian neighbours, it will do so with international support. The Australian Government currently provides funds through AusAID. This is mostly focused on health, education, and agriculture, and expected to increase significatnly in the coming years. The Australian Ambassador plays a significant role in all the government relations our country has within Myanmar. Bronte Moules is the Australian Ambassador in Myanmar. A pleasant and charming woman, who is highly respected. 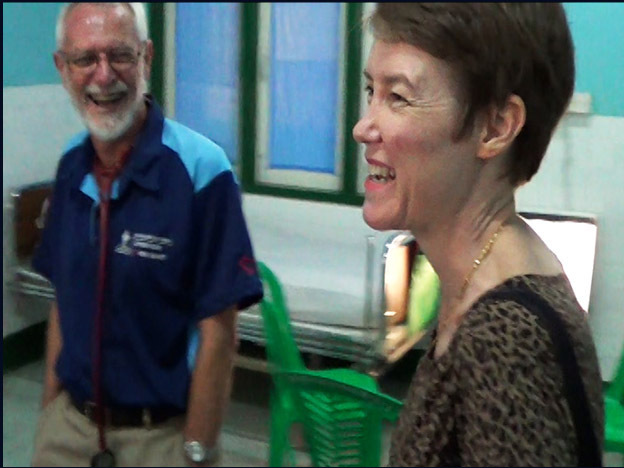 During our stay in Yangon, Operation Open Heart with Professor Tin Maung Aye, had the good fortune to give the Ambassador and the Australian Embassy Resident GP, Mark Hampson, a tour of our achievements in the Yangon Military Hospital. Professor Tin Maung Aye helping the Ambassador, Bronte Moules, gown up for a visit to the cardiac theatre. 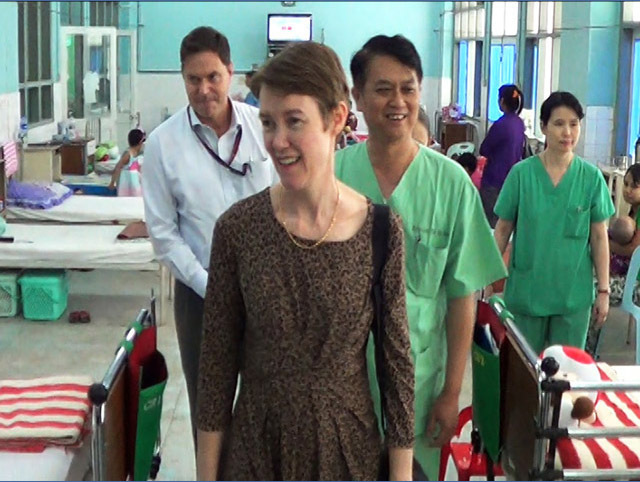 (R) The Ambassador and Professor visiting the post op cardiac ward with GP Dr. Mark Hampson to the left, and RN Sandar Ko to the right.